Historian David Rotenstein has documented the effects of urban renewal in neighborhoods of Dekalb County, Georgia, including Decatur. 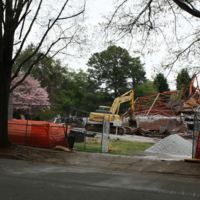 In 2014 he photographed the demolition of the third location of Antioch A.M.E. Church on Hibernia Avenue (what had previously been Atlanta Avenue in the heart of the Beacon Hill neighborhood). Dr. Rotenstein offered permission to include his photos in the Antioch A.M.E. digital archive. You can also see his blog posts on the subject at http://blog.historian4hire.net/2014/01/29/antiochs-eyes/. David Rotenstein holds copyright to these images. 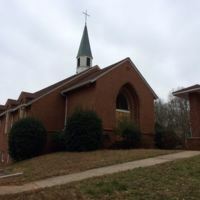 Photograph taken in January 2014 by David Rotenstein of the south facing facade of the former Antioch A.M.E. Church on Hibernia Avenue in Decatur, Ga. 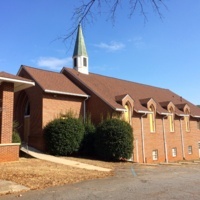 Photograph taken in January 2014 by David Rotenstein of the east facing facade of the former Antioch A.M.E. Church on Hibernia Avenue in Decatur, Ga. 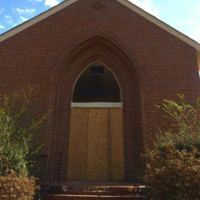 Photograph taken in January 2014 by David Rotenstein of the west facing facade of the former Antioch A.M.E. Church on Hibernia Avenue in Decatur, Ga. (1 of 2). 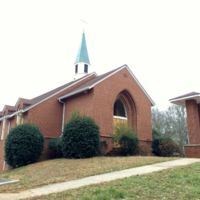 Photograph taken in January 2014 by David Rotenstein of the west facing facade of the former Antioch A.M.E. Church on Hibernia Avenue in Decatur, Ga. (2 of 2). 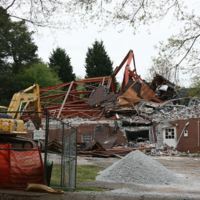 Photograph taken on April 18, 2014 by David Rotenstein of the demolition of the former Antioch A.M.E. Church on Hibernia Avenue in Decatur, Ga. (1 of 2). Photograph taken on April 18, 2014 by David Rotenstein of the demolition of the former Antioch A.M.E. Church on Hibernia Avenue in Decatur, Georgia. (2 of 2).